Published by Cyril Huze April 15th, 2016	in Customs, Editorial and Wheels. A new Sinister Wheel model joined the Bad Boy Collection. 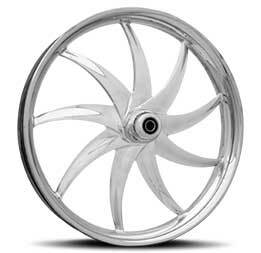 CNC in-house machined from 6061-T6 Aluminum Rotary forged Billet and available in chrome, copper, black & machined and custom Colors of your Choice. Like the rest of the Bad Boy lineup, all stock and custom sizes available from 16” to 32” including ABS (add $50). Paint upgrade is available for $325 (16” thru 23”), and $400 (26”, 30” and 32”). Matching pulleys from 11.5” to 18” (61T to 70T) and sprockets 48T and 51T. At Sinister Wheels. 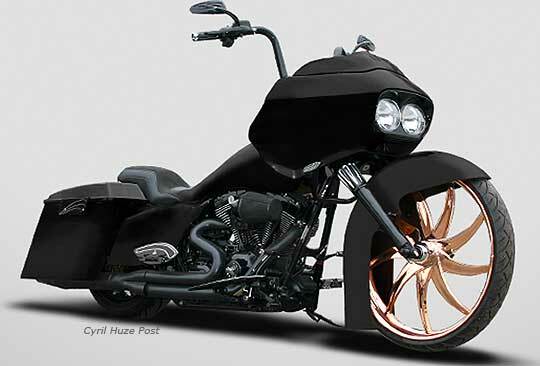 A half-ton motorcycle with no front brake — good idea! Uhmmm, Thanks but, No Thanks !!! 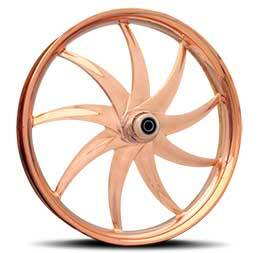 Great looking wheel, especially in copper.